Congrats to John Head for being named one of this year’s IBM Champions for IBM Collaboration Solutions. Way to go, John. The honor and the recognition is well deserved for someone who’s been a tireless champion of Lotus for so many years. The folks at Packt Publishing are continuing to expand their shelf of IBM Lotus books. Their latest addition – Classic Web Application Development Techniques by Richard G. Ellis. Before I tell you how absolutely awesome this book is, I have to get something off my chest. The word “Classic” in the title is the absolute key word here. Mr. Ellis starts off the book by saying that everything here was written for and tested with Domino Designer 8.0. Upon reading that sentence I just had to go back to the very first page to check the publication date: someone is playing a trick on me. Alas, no tricks. The book was indeed published in March of 2011. The book also stays away, far away, from anything related to XPages and says so right off bat. But it is about classic development after all. Once you get over those two facts, the book is actually very good. If you are an advanced Domino developer building web applications every day, this book may not be for you. But if you are a Notes developer who is making a transition to the web and want to know how to web enable your awesome Notes apps without looking like they were built by 5th-grader in 1999, get a copy of the book. You’ll be hard pressed to find a better single source collection of Domino web development tricks. Look, ma. I’m in a book! 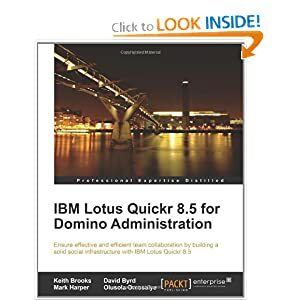 I was fortunate enough to be a reviewer of Packt’s new book in the IBM’s series: Lotus Quickr 8.5 for Domino Administration. It was last week this time that I was saying goodbye to the sunny and warm Orlando and dreading facing the 6-foot piles of snow on my driveway back home in Chicago. 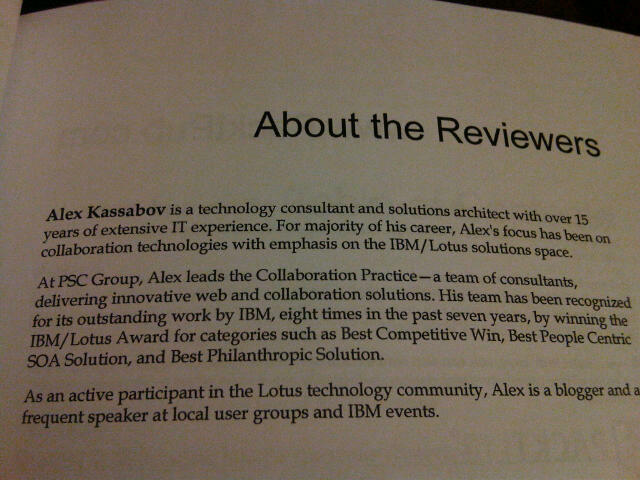 A week later, I keep looking back at Lotusphere 2011 and wondering what it was that I walked away with. Last night, someone asked me how the Lotusphere went and what was new. I summed it up in two words: “Get. Social”. “Oh yeah,” I added, “and Xpages”. I could’ve mentioned all the various sessions I attended (the most in years), the new layout of the showcase floor, the debate of whether the attendance was up or down, whether there were more or less exhibitors or even Harry Potter on Wednesday night. But to me, the social and the Xpages were the key themes of the conference. And that was disappointing. When you go to a software company’s biggest annual conference, you want to be wowed by all the great cool stuff they’ve been working on during the previous year and are getting ready to release. You want to see new and improved versions of existing software, breakthrough new software ideas: things that will ensure the said software company’s market leadership and growth. To me, all of that was missing from Lotusphere 2011. Or maybe I’m just old and cynical. Or maybe it is better to have my (most likely) last Lotusphere end on a down note: I won’t be sorry not to return. But I am going to miss this..
What did you think of the event? Was it better for you than it was for me? Many congratulations to Luis Guirigay for having his article on Advantages and Best Practices of Local Mail Replicas published in the Domino Wiki. After many review cycles the article was finally added to the wiki. If there’s anything you wanted to know about local mail replicas but were afraid to ask, Luis is the ultimate authority on the subject. It’s great to see another article published by the PSC team. I took the plunge. I finally did it. I moved. As some folks read and reacted with disbelief on Twitter, I switched my email platform from Notes to Exchange. We, at PSC, have been running both systems in parallel for quite some while: Exchange for the Microsoft team, Notes for the IBM/Lotus team. And as a Mac user, I just wanted to use Mac Mail and iCal. Sadly, Lotus continues to take the high road when it comes to allowing people to use clients other than Notes with its Domino servers. And Exchange 2010 integrates rather nicely with Apple and its native Mac apps. I’ve been tempted to make the switch for quite some while now. End of the year, my calendar being pretty empty, seemed like the right time to do it. I am rather impressed how simple and uneventful the move was. I had to setup some general mail settings (signature, refresh frequency), configure appearance and configuration of my BlackBerry, that was about it. I used IMAP to download email from Domino into Mac Mail. That way I still have easy access to all my messages from Notes. Mac Mail allows me to easily move things around between accounts as does iCal and Address, making populating my newly minted Exchange account a snap. The biggest issue I had were my contacts. For some odd reason, Mac Address would not import all contacts exported from Notes in a VCF file. Out of 300-some contacts, it would only import 13 – 15. I had to resort to the magic of Outlook 2011, which imported everything perfectly and synchronized with Mac Address. If I think about it, I’ve never ever used anything other than Notes for email in a corporate environment. We’ll see how this experiment (pardon, “move”) works out for me. I yet might switch to Outlook 2011. One thing I miss already is the ability to be prompted whether I want to save a copy of the message in my Sent folder. Not happy about my Sent folder filling up with silly 1-line responses. Anybody knows if Mac Mail can be configured to prompt? Can IBM Vulcanize Lotus’ tires? 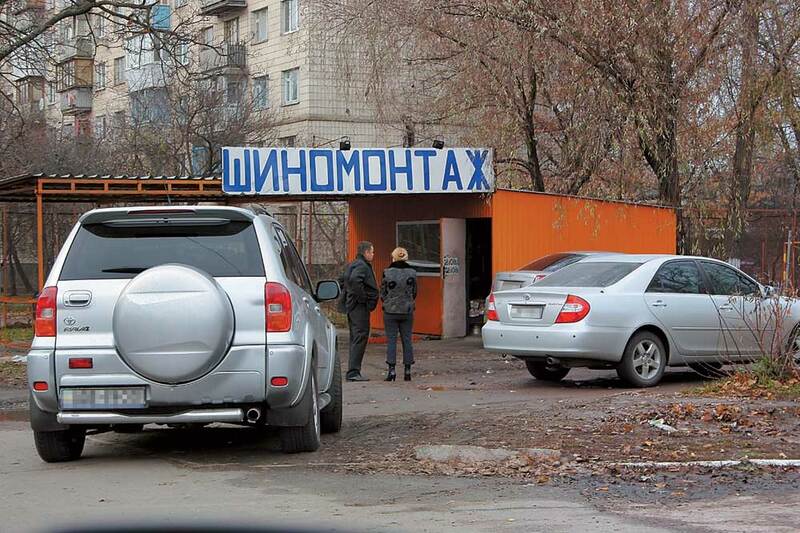 In Russia, vulcanization (вулканизация) is a popular method of repairing damaged tires and, often, a profitable roadside business. So when listening to presentations on Project Vulcan, I can’t get an image of an Eastern European road tire shop out of my head. Vulcanization may be a good idea for a new tire on a commuter car. How well it will work for a 20-year-old Lotus and a set of tires that are at least 10 years old remains to be see. Will IBM be a happy vulcanizer, giving its Lotus a new lease on life once Project Vulcan goes live? Or will IBM find that its Lotus has too many other problems that go deeper than a set of patched up tires? Project Vulcan is a great vision that has a lot of passionate support among Lotus’ teams, betting that customers will embrace this vision of collaboration of the future. The question, of course, will the customers want their employees to be able to do all of their work from an enhanced inbox or will they exchange their freshly vulcanized Lotus for another ride.